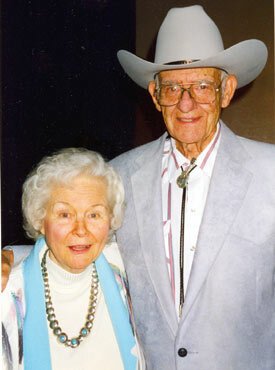 Singers Wesley and Marilyn Tuttle at a Western Music Association gathering in Tucson, Arizona, in 1997. Wes appeared in several westerns with Johnny Mack Brown, Jimmy Wakely and others. 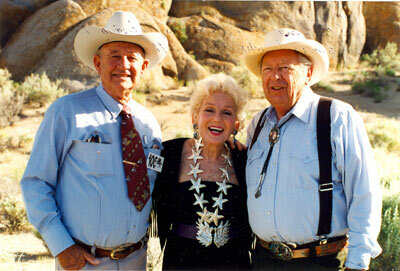 The couple worked together on TV’s “Ranch Party” with Tex Ritter. 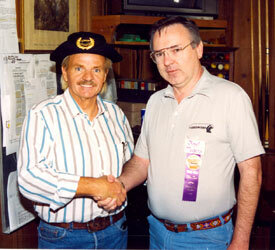 The real Lee Aaker made his first film festival appearance at Sonora, California, in September ‘93. 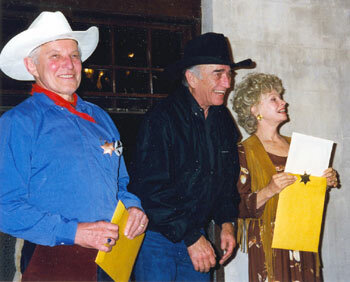 WC’s Boyd Magers (right), with the help of Lee’s friend Paul Petersen, helped expose the fake Lee Aaker (Paul Klein) who had attended several western film festivals passing himself off as Lee. 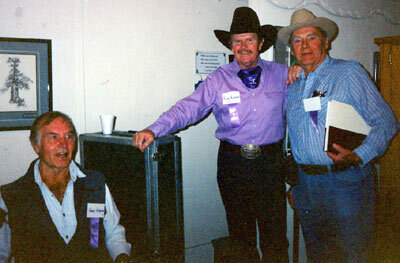 George Montgomery, Rusty Richards (formerly of the Sons of the Pioneers) and Walter Reed at the Toulumne County, Sonora, California, Wild West Film Fest in 1991. 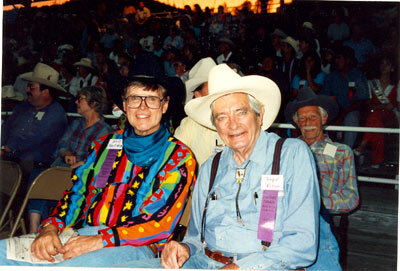 Montie Montana Jr. and Walter Reed at the Toulumne County, Sonora, California, Wild West Film Fest in 1991. 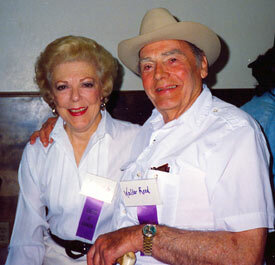 Virginia Vale and Walter Reed at the Toulumne County, Sonora, California, Wild West Film Fest in 1991. 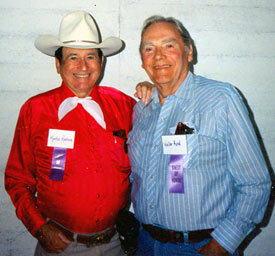 Ben Johnson (red shirt) and Pierce Lyden (black outfit) get ready for the annual parade at the Toulumne County, Sonora, California, Wild West Film Fest in 1991. WC’s Boyd and Donna Magers and Virginia Vale are directly behind and to the left of Ben. 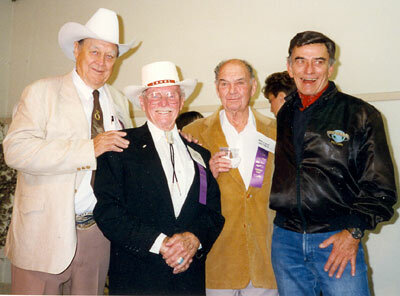 At the Toulumne County, Sonora, California, Wild West Film Fest in 1991, gun spinner and entertainer Mark Allen, director Bob Totten, Walter Reed and Ben Johnson. 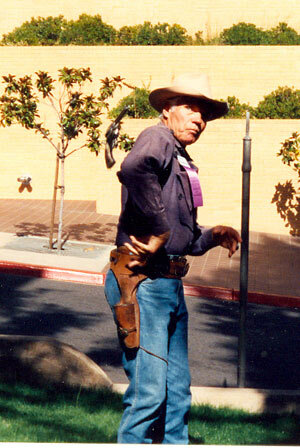 The fastest gun alive, Kelo Henderson of TV’s “26 Men”, performs some expert gun handling at the Toulumne County, Sonora, California, Wild West Film Fest in 1992. 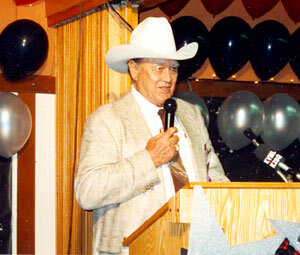 Ben Johnson accepts an award at the Toulumne County, Sonora, California, Wild West Film Fest in 1992. 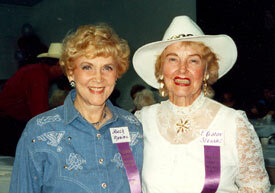 B-western leading ladies Beth Marion and Eleanot Stewart at the Toulumne County, Sonora, California, Wild West Film Fest in 1992. 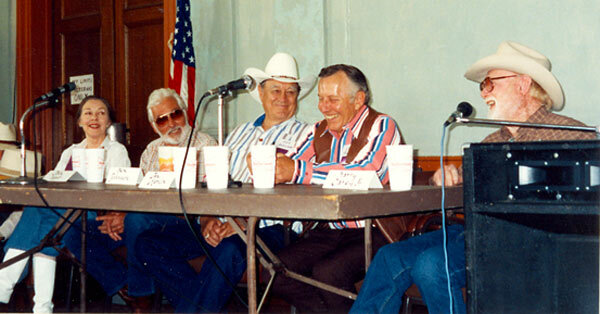 Celebrity panel discussion at the Toulumne County, Sonora, California, Wild West Film Fest in 1992 with (l-r) Lois Hall, John Hart, Ben Johnson, Jan Merlin, Harry Carey Jr.
Will Hutchins and Royal Dano at the Toulumne County, Sonora, California, Wild West Film Fest rodeo in 1992. Behind Dano is John Lupton. 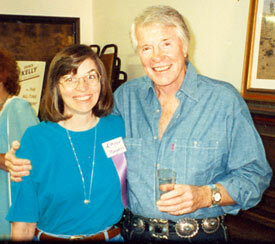 Robert Horton and WC's Donna Magers pose for the camera at the Toulumne County, Sonora, California, Wild West Film Fest in 1992. 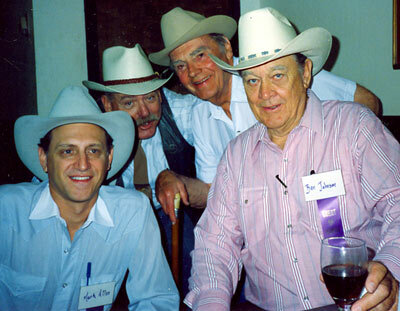 Ben Johnson, director Earl Bellamy, director William Witney and James Drury at a Toulumne County, Sonora, California, Wild West Film Fest. 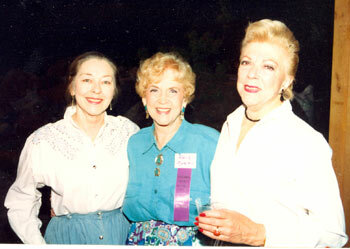 Three gorgeous B-western leading ladies at a Toulumne County, Sonora, California, Wild West Film Fest...(l-r) Lois Hall, Beth Marion, Virginia Vale. What a great cast at the Lone Pine Film Festival in October ‘03. (l-r) Ben Cooper, Ty Hardin, Michael Dante, Clint Walker, Kelo Henderson, Steve Mitchell, William Smith, Peter Brown, Robert Horton. Out amongst the Alabama Hills of Lone Pine, California, Jimmy Rogers (son of Will Rogers), the late Grace Bradley Boyd (Mrs. Hoppy) and Rand (“Lucky”) Brooks. 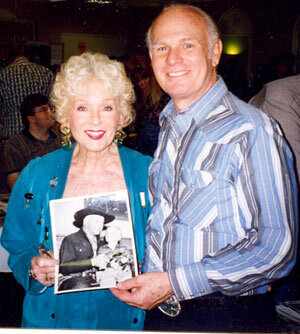 Grace Bradley Boyd with Gary Gray who holds a very young picture of he and William Boyd (Hopalong Cassidy). Taken at one of the Ray Courts memorabilia shows in North Hollywood, California. 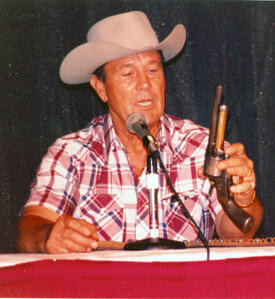 Don (“Johnny Ringo”) Durant explains the working of his seven-shooter LeMat at the Charlotte, NC, Western Film Fair in 1991. 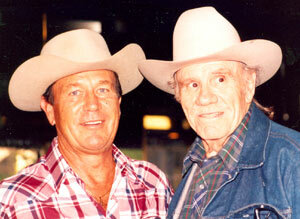 Don (“Johnny Ringo”) Durant with fabulous western heavy R. G. Armstrong at the Charlotte, NC, Western Film Fair in 1991. 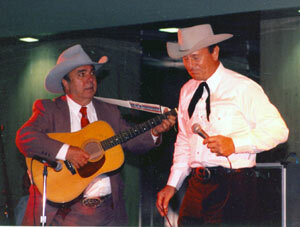 Dale Berry accompanies Don Durant as Don sings his “Johnny Ringo” themesong at the banquet of the Charlotte, NC, Western Film Fair in 1991.